Try making one of these pickle-filled sandwiches for yourself and be amazed by how tasty they are! This Hummus and Pickled Veggie Sandwich is a must for pickled veggie lovers! We will be totally honest here when we say that it's hard to make a vegetarian sandwich that excites us (...unless it's a grilled cheese of course!) But it doesn't have to be like that! Say goodbye to lifeless limp vegetables and start piling on some pickled vegetables, some savory protein-packed hummus, and crisp, fresh produce. By switching up the veggies, you can create a sandwich that's anything but boring. In Florida the residents and the Cuban sandwich have some history. With it's salty, rich, and tangy flavors, this sandwich is the epitome of Cuban cuisine. But don't worry, you don't have to go to Tampa, Miami or Cuba to find the perfect Cuban sandwich - with this simple and easy recipe, you can make it right at home! Korean Bulgogi Beef Steamed Buns are made with a spicy blend of gochujang, ginger, garlic, spices, and soy sauce, marinated, grilled, and stuffed into light, fluffy, and slightly sweet steamed buns. Fresh shredded carrot, sprigs of cilantro, slices of pickled burdock (or radish), and pickled cucumbers rounds are added to the sandwich to lighten and freshen it up. And as for the kewpie mayo, well that creamy Japanese goodness is smeared on the inside of the steamed buns to help it all stay together. And trust us, if you're mouth isn't watering, go ahead and re-read the first few sentences. See what we mean? Ok, it's time for you to try this. This smoked salmon bagel sandwich recipe, made with grilled asparagus, pickled red onions, soft scrambled eggs with fresh dill and cream cheese on a toasted everything bagel might just be the best version we've ever made! And if you're up for a challenge, try this recipe for smoking the salmon yourself using this smoked salmon recipe. Po'boys are a classic Louisiana staple. Made with a special french baguette, that's light and fluffy in the middle and crispy on the exterior, these sandwiches were originally made with scraps and given out for free to working class men- hence the name poor boy. Usually made with seafood, or other local southern seafood, this rendition calls for a mix of light and dark meat. If you fancy mustard, we recommend a coarse creole mustard which can probably be found at your local grocery store. Vegetarian Sloppy Joes made with a mix of barley and caramelized vegetables are just as good - if not better - than the typical hamburger based versions. Packed full of flavor, vitamins, and nutrients, these guilt-free sandwiches will please even the most die-hard of meat eaters. 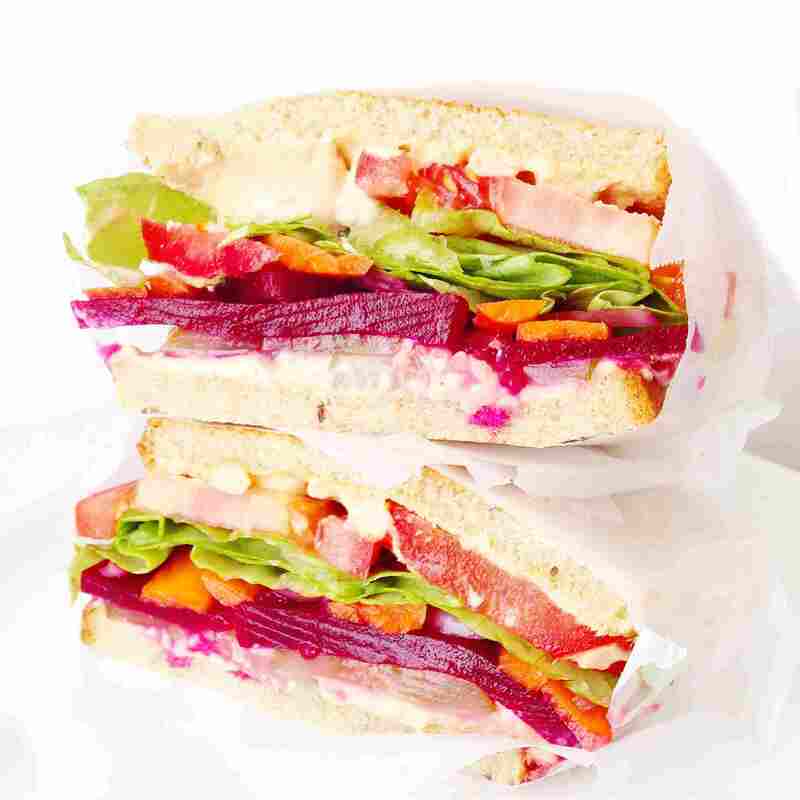 And by topping these sandwiches with fermented vegetables such as DIY quick pickled radish and cucumbers, a significant dose of healthy probiotics are added to each bite. This Spicy Chicken Biscuit Sandwich has super crispy fried chicken and tangy homemade pickles, slathered with a hot and spicy pepper sauce and packed into a buttery biscuit. Can't stand the heat? No problem. Check out this chicken sandwich or simply leave out the peppers from the ingredients below. Quick pickled slaw, made with carrots, cucumber, onion, mint and cilantro, paneer cheese, and yellow curry sauce get grilled between to crispy pieces of naan bread to make one Indian style grilled cheese that is crisp and fresh. This ultimate grilled cheese sandwich is loaded with Wisconsin's best aged sharp cheddar, sweet and savory homemade bacon jam, and spicy pickled jalapeños. It's rich, creamy, crunchy, meaty, cheesy, sweet, and spicy and basically encapsulates every delicious flavor between two hearty slices of buttery Texas toast. Buttery roasted corn, spicy jalapenos, and rich manchego cheese come together in this zesty Roasted Corn Grilled Cheese. Hawaiian Pizza Grilled Cheese is heaven on bread. Grabbing a slice of pineapple and ham pizza is nothing out of the ordinary, but what about transforming that dish into an exotic grilled cheese filled with sweet vibrant chunks of fresh pineapple, spicy rings of pickled jalapeños, milky strands of melted mozzarella and a umami-esque tomato sauce. All these ingredients melodically combine to help pack this Hawaiian pizza style grilled cheese full of flavor. Want more protein? Add some ham or pepperoni. Either way, this sandwich is to die for. Sweet and savory hoison glazed mushrooms, creamy kewpie mayo, nutty toasted sesame seeds, and bright cilantro come together between two pillowy steamed buns in this Vegetarian Steamed Bun. Traditionally made with pork belly, this version of bao is not only vegetarian-friendly but even meat lovers will dig its umami richness.